Google updated the Android distribution numbers today for the month of May, showing Marshmallow continuing its steady climb, while the rest of the Android versions in the wild stay mostly the same. As of May 2, Android 6.0 Marshmallow sits on 7.5% of devices, which is up from 4.6% in April. 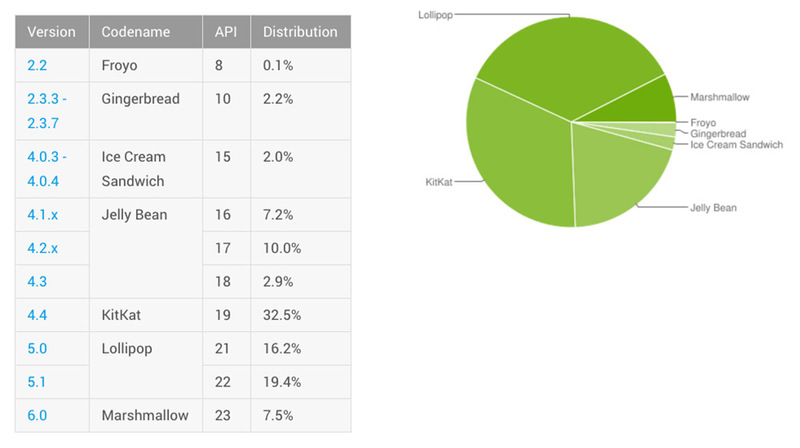 On a non-increasing front, Lollipop dropped to 35.6% (from 35.8%), KitKat to 32.5% (from 33.4%), Jelly Bean to 20.1% (from 22.3%), Ice Cream Sandwich to 2.0% (from 2.2%), and Gingerbread to 2.2% (from 2.6%). Froyo remained at 0.1%.